This particular sound effect was actually used only for unlocking new areas of the map with the Sheikah Slate, and I actually really appreciated its minimal use. Here’s how the sound plays out in Breath of the Wild. The video starts at 20:20, and the series of sounds is from 20:38 – 20:47, and then at 20:56. There are other little sound effects in this game that are mostly piano-based, and this simple orchestration makes for such a delicate introduction—delicacy, as well as poignant and striking isolation. An instrument with such a vast range in terms of both pitch and emotional capacity, the piano is able to convey all kinds of moods and atmospheres single-handedly, while maintaining the simplicity in nature of being a single instrument. The piano tracks in this game are very simple, and in most cases very likely not even requiring more than one hand to play. Every other Legend of Zelda game before this one has been absolutely chock-full of music—wonderful, upbeat, heavily orchestrated (yes, chip tune is orchestrated), catchy, and memorable music. From the villages you first wake up in, to the fields, Fairy fountains, dungeons, and boss battles… One of the key characteristics of every single LoZ game before this one is indeed the abundance of energetic, lovable music. So to wake up in a mysterious place, by yourself, with nothing to guide you but a mysterious voice, and to have such an utter LACK of music—other than delicate piano, subtle winds, light percussion, and unidentifiable electronic sounds—was jarring to say the least. Yes, when you exit the cavern and see the open world for the first time, there is quite a sweeping, but short, overture. After that though… Mostly silence. Link and you as the player are immediately thrown into a world of unknown, with the occasional Old Man visits and the piano as essentially your only companions. The simple piano riffs were a constant reminder of how alone you are throughout the bulk of this game. The mountain, waterside, cave, and Sheikah tower musical tracks were so sparsely arranged that they ended up blending into the experience without absolutely taking over, aurally. I have read how some other players have been displeased with the general scarcity of music, but I believe it was incredibly purposeful, powerful, and refreshing. In a brand new kind of game (open world), a brand new soundtrack style was only natural and extraordinarily fitting. As the gameplay and aesthetics began to mirror real life more so than any other LoZ game, the music naturally followed suit. Having such an absence of musical companionship in the beginning (and whenever you’re exploring thereafter) consequently made the music of the towns, villages, and stables (which are filled with people and other characters) all that much more comforting. Stables Theme: All Your Horsey Needs! One of my favorite parts about many of the musical themes in this game is the fact that they are first heard from a distance, as Link is approaching, and then the music becomes more audible the closer he gets. I found the stable theme to be very cozy, with its soft bongos and tambourine, guitar, and flute-like wind instrument. The small ensemble certainly gives a homey feel, as it is a type of instrumental group that would reasonably gather at such a location to play a simple tune such as this together. An absolutely adorable addition to this theme was when the Rito traveler Kass would sometimes show up, playing Epona’s song/Lon Lon Ranch on his accordion, which provided a beautifully nostalgic counter-melody. Major kudos to the composers of this game, Manaka Kataoka and Yasuaki Iwata, who fit in one of Koji Kondo’s iconic, timeless themes seamlessly together with a new one. It was only fitting also for the character Kass to be playing it, as he is very knowledgeable about historical music, often playing various tunes that accompanied shrine quest riddles, which his teacher had passed down to him. So many of the character-inhabited places had such simply orchestrated and tender music. My personal favorite track of the entire game (by a small margin) is the theme for Hateno Village. There is simply a magically whimsical feel to it, with the bongos + maracas, slow wavering strings + bass pizzicato, treble-end marimba tremolos, and leading bagpipe-esque instrument and violin. Not to mention the village theme changes depending on the time of day, as do other character-inhabited places in Hyrule. These comforting town and village themes provided a wonderful contrast to the aforementioned lonely piano tracks… As well as contrasting the downright terrifying tracks that creep up on you with no warning whatsoever. Similar to any traumatizing or otherwise life-altering event, ask anyone who has played Breath of the Wild, and they will most likely be able to tell you where they were when they experienced their first Blood Moon. For me, I was passing by a serene waterside, having just easily defeated a little group of Bokoblins. I was running along, minding my own business, when suddenly I heard an eerie sound. Then another. Some flute trills. A few reversed sounds. The air unexplainably started producing bits of burning ash, as a terrifying electronic (or at least probably electronically altered), slightly screeching sound broke through, along with a flurry of unsettling bass piano notes. The entire sky turned the most ominous shade of crimson, and the clouds began to speed past, above me. I had no idea what was happening, and I desperately tried to run away from whatever doom was encroaching upon me. But no matter which way I turned, I simply could not escape. A horrifying growl tore through the air and the screen turned black. At first, I absolutely hated whenever the Blood Moon would arrive, simply because of the awful, scary music. It wasn’t until I realized how genius the mechanic was—all enemies respawn in a way that actually relates to the plot—that I became more okay with it, and even looked forward to it, at least conceptually. It was not until I was maybe 90% done with the game that I realized you could actually fight back and destroy these horrible, traitorous, multi-legged, mechanical atrocities. So, needless to say, I spent most of the game thoroughly terrified of these seemingly immortal enemies. A cool feature that I noticed in Guardian battle themes, though, as well as Shrine themes (regular + battle) was the industrial nature, with tons of electronic instruments and electronic effects, which provide a stark contrast to the aforementioned gentle, solitary feel that the piano gives in other contexts. The addition of electronic music in Sheikah technology-filled places made sense story-wise, since the Sheikah gadgets were very futuristic, especially in comparison to other cultures in Hyrule. Another one of the particularly interesting parts of the Guardian battle music is that when you do land your first strike on the enemy, a satisfying charge-like sound plays. Unfortunately, all of the OST files I found on YouTube do not include any of the *~awesome sound effects~* that really make this track, so while you can listen to the full track here, it isn’t as great as the full experience because of the lack of sound effects. Speaking of in-game changes that affect the sound design, and without getting into too many spoilers, each of the four Divine Beast dungeon themes also had quite genius alterations based on progress. When I first played Legend of Zelda: Majora’s Mask, my brother was very excited for me to get to the fourth dungeon, in Ikana Canyon, the Stone Tower. A completely new and innovative technique in any video game I had played thus far, the flipping-the-tower-upside-down mechanic was mind-blowing. In Breath of the Wild, the developers took this a step further, by allowing players to rotate different parts—or sometimes the entirety, in different ways—of the dungeon itself, which triggered an echoing cry of the Divine Beast. Divine Beast Vah Naboris was the first one of the four that I did, and it was undoubtedly also the most difficult. I love the similarities in this track to the Gerudo Town theme, how it carries the same main melodies but with some electronic effects, and without nearly as steady of a beat. My favorite Divine Beast however, was Vah Ruta—by a small margin though (a common trend in favorites in this game, apparently). The mechanics in the dungeon made me feel super clever, and I just loved the gentle, heart-wrenching story behind this particular Champion. To perhaps demonstrate the extremely unsettling nature of such a kind-hearted, nurturing character’s horrific demise, this Divine Beast has a progressively ominous musical track. The Three Mystical Dragons: Bring Out the Erhu! 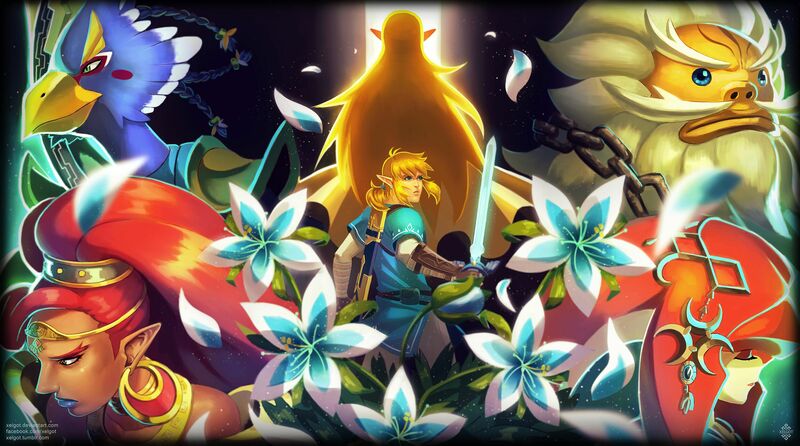 Legend of Zelda: Breath of the Wild was an immensely enjoyable game to play, with such an incredible diversity in terms of set design, characters, game mechanics, and music. No other LoZ game gave me such an emotional range and sense of immersion as this one did. While that is largely due to the new open-world genre, it was also very much because of the soundtrack, which was subtle at times, loud and obnoxious at others, horrifying, yet gentle, and all the while delicately balanced. A huge thank-you to all of the amazing artists who generously agreed to have their artwork featured in this review! Check out their pages for more incredible art, time-lapse videos, and more! This is amazing!!! The way you described all the different music in the game is absolutely phenomenal!! Thank you for featuring my art! anyway, good job on this and thanks for featuring my art! Thanks for reading my article! It definitely took a pretty long time, as do all of my in-depth reviews, so I appreciate the extra long comment hehe 😀 I feel like I need to play through this entire game again to really appreciate everything that is has to offer, not just the music! To address what you said about Hyrule Castle: I honestly didn’t spend much time in the castle except for at the very end, so I don’t remember it as well… ^__^’ I also have tended to write such monstrously long articles that this time, I wanted to really narrow in on my particular favorite/stand-out tracks, while briefly talking about others as much as I could haha but now that you mention it I’ll go listen to it again!